Each 190mm slat on the Kirra 2400 Kwila Outdoor Timber Setting is solid – 42mm in thickness for the table and 32mm for the benches – it’s really heavy!! The design is straight forward – very neat – excellent for long balconies as you can tuck the benches away underneath when not in use. Crafted from one of the world’s most durable hardwood timbers – Kwila (also known as Merbau) – with its sturdiness makes it ideal for use in varied climates, it’s easy to maintain and the rich colour always looks superb. 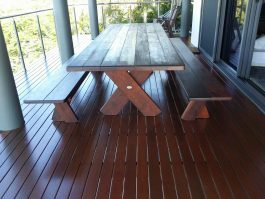 The setting pictured was in Ironbark timber – the Kirra 2400 Kwila Outdoor Timber Setting has slightly different cross legs – please see images below to clarify new design. Each slat on the Kirra 2100 Kwila Outdoor Timber Setting is solid – 42mm in thickness for the table and 32mm for the benches – there is no chance this setting will blow about in a gust of wind. Hand crafted from one of the world’s most durable hardwood timbers – Kwila (also known as Merbau) – with its sturdiness makes it ideal for use in varied climates, it’s easy to maintain and the rich colour always looks superb. Sports clubs and public places are usually a hive of activity. Make yours stand out from the others by offering them the A-Frame 1500 Cypress Outdoor Timber Picnic Setting. Give your outdoor space a great eating area with the A-Frame 1500 Cypress Outdoor Timber Picnic Setting. Featuring a 1500mm rectangular table top with fixed benches either side, this setting provides seating comfortably for six. Summer, picnic, good mood: this is all conveyed by the A-Frame 1500 Kwila Outdoor Timber Picnic Setting in which the table and benches are connected securely to one another. Turn your backyard into an entertaining venue for the neighbours, friends or family to have BBQ’s and celebrations. A classic A-Frame 1800 Cypress Outdoor Timber Picnic Setting, with its elbow-to-elbow dining and climb over seating works, in all terrains so you can move it off the deck and onto the grass. This old favorite has been in The Solid Timber Man range for nearly 20 years. Highly affordable – designed for stability, convenience and years of heavy outdoor use. By adding extra length to the over hanging ends the setting can be wheelchair accessible also. Specifically designed for outdoor spaces, this A-Frame 1800 Kwila Outdoor Timber Picnic Setting can accommodate up to eight people and is an ideal choice where space is at a premium but high capacity seating is required. It’s supposed to make a space more user-friendly and enjoyable, by adding extra length to the table top of the A-Frame 1800 Kwila Outdoor Timber Picnic Setting, the setting becomes inclusive for wheelchair access. The versatile A-Frame 2100 Cypress Outdoor Timber Picnic Setting will seat eight adults easily. Makes a great addition to any camp ground, beer garden or breakout area. Specifically designed for outdoor spaces, this A-Frame 2100 Kwila Outdoor Timber Setting can accommodate up to eight people and is an ideal choice where space is at a premium but high capacity seating is required. It’s supposed to make a space more user-friendly and enjoyable, by adding extra length to the table top of the A-Frame 2100 Kwila Outdoor Timber Picnic Setting, the setting becomes inclusive for wheelchair access. The A-Frame Kwila Outdoor Timber Picnic Setting EBB is free standing with the bench seats and table connected securely to one another. 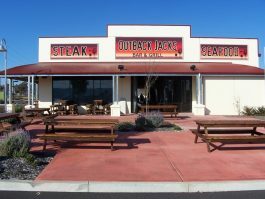 The setting is robust and bulky, making it suitable for outdoor areas where there could be a risk of theft. Specifically designed for outdoor spaces, this setting can accommodate up to eight people and is an ideal choice where space is at a premium but high capacity seating is required.